“Love Sick” put together almost everything I’ve desperately wanted from an episode of Grimm this entire season. It’s the culmination of a serialized plot without the episodic plot that typified almost every previous hour of the show. I have to say I didn’t expect the Adalind plot to wrap up this fast, but if that’s necessary to get to the larger conflict behind what Nick already knows, I’m all for it. Other than “Organ Grinder,” the “Hansel and Gretel” episode, this is the best that Grimm has to offer. It won’t win over new converts, since anyone watching without prior knowledge of the show would be completely lost, but it’s a strong, compelling story with moments of humor, ingenuity, and suspense. To start, we learn that Captain Renard is part of a "family." Or he’s in opposition with a family—details are still scare. What matters is that he meets two men, one British and one Swiss, to discuss Renard obtaining the key that Nick received from Aunt Marie in the pilot. Yes, it’s been months since that little object was introduced, but Nick made some progess with it in the Magic Trailer this week after spilling a bottle of ink, of all things. Renard doesn’t want to force things, but in a display of his power, kills both other men, then tampers with evidence when Nick and Hank get the case in order to make it a dead end. Renard also orders Adalind to speed things up with Hank. We meet Adalind’s mother Catherine in this episode, another Hexenbiest who advises her daughter, and reveals that Renard owes other prominent members of the Wesen world a debt because of something related to Catherine. They need Nick’s key, which he’s only now figuring out displays some sort of important image, which makes it desirable. I don’t trust that Grimm will be able to go back to this plot anytime soon, which makes me hesistant to feel so positive about a lot of serialized progress. In the same vein as other procedurals that dump out overarching plot in one episode to keep the audience tided over for half a season, I'm sure that we'll get episodic plots dotted with slow progress. But I’ll take what I can get. Nick and Juliette’s dinner with Hank and Adalind was awkward, but Nick and Adalind play off each other well when on their own, and they make good rivals. The build throughout the episode, and the fight over Hank’s sanity, has a lot of tension, and Hank’s deterioration due to Adalind’s blood potion has some serious effects. The final fight scene may descend into some laughably bad choreography and visual effects worthy of Buffy's legacy, but now we’ve seen Nick defeat a creature without just killing them. He has the power to remove Wesen abilities and render them useless, to use the knowledge he gains in order to conquer his enemies. Now if only he’d just realize Renard is in on the whole thing and stop revealing every detail that brings him closer to uncovering that part of the story to his captain. Eddie Monroe and Rosalee are working wonderfully as a team, making my favorite part of the show even better. It makes Nick’s partnership so much more useful to not only have a Wesen to go to for advice, but a specific location with so many items related to the creature world, and not just killing or controlling them. In short, the shop is better than the Magic Trailer/Winnebago/whatever model it is. Eddie Monroe as the spiritual advisor separated from the book depository of the Magic Trailer is too spread out, and Nick can’t just go there every time, so Rosalee’s apothecary is a much better rallying location for discussion, and some overt suggestions of romance. It helps that Eddie and Rosalee have more chemistry than anyone else on the show right now. Nick and Juliette should be taking notes. Thankfully, the Sgt. Wu tangent came to an end, and even better, it helped solve what was going on with Hank. Wu kept eating random object, from staples to coins to chapstick, and after he collapses in the police station, a hospital removes a bunch of indigestible items from his stomach. Rosalee remembers the first time she helped save St. Wu, which starts the line of thinking that produces an antidote to Adalind’s poison. I really liked that Rosalee didn’t immediately know the answer to the problem. Searching for the right potion could be construed as stalling for time, but I viewed it as necessary to keep Rosalee from seeming all-knowing. She’s a recovering addict and wasn’t as in tune with the business as her brother, so it should take her and Eddie a lot of time to come up with the right answer. Hank’s infatuation with Adalind almost proves fatal, even though it’s obvious he isn’t really in danger as a major cast member. 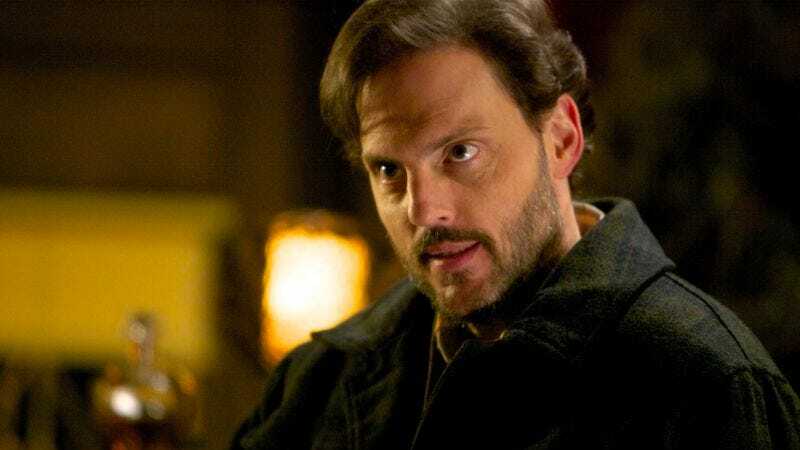 I liked the twist in the fight that allowed Nick to gain the upper hand and defeat Adalind, and the way in which Eddie punctuated almost every dramatic moment with a one-liner that let the air out of the room. Hank’s love potion/blood potion puts him in a coma, but we don’t see any of the aftermath once Nick does what’s necessary to wake him up. That gap of explanation is going to get harder to justify, especially when Nick brings Rosalee and Eddie around to see Juliette, Wu, and Hank. Still, this episode came together rather seamlessly, to the point where I just casually ignored the German I didn’t understand and went along for the ride. No one-time guest stars, no re-interpretation of a fairy tale, just a giant glut of progress. Every procedural has a few like this in each season, and I’m just wired to like these a lot more than a typical episode. I want that progress, the burst forward in story blended with deepening of character and world expansion. Grimm has the ability to do that, and a plot line to pursue in that endeavor, but it still hews to closely to the procedural standard of delayed gratification, doling out only enough information per hour to last multiple years before actually altering the world. My favorite episode of the season so far remains “Organ Grinder,” because it blended a wonderfully twisted version of a classic fairy tale with some great character work while still advancing the overarching plot. “Love Sick” doesn’t provide that intriguing take on a fairy tale—the epigraph comes from the Grimm fairy tale “Donkey Cabagges,” which has very little to do with the action of the episode, but everything else is in place. I didn’t expect the plot with Adalind to wrap up so quickly, especially since she was re-introduced relatively recently after a long layoff. I’ve warmed up to the idea of Grimm taking time to reach its potential. Buffy was a slow starter, as was Angel, so there are plently of reasons to believe that given the same room to explore and grow, Grimm could find its proper footing. 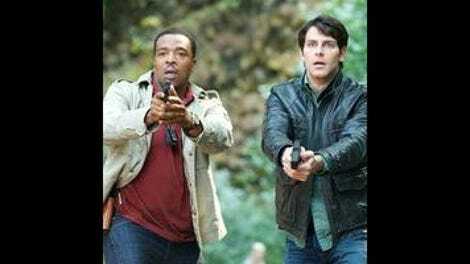 NBC has only renewed a few shows so far this spring, but Grimm came earlier than the others. That’s a good sign, but this isn’t The WB, so I hope the show can find the right balance soon. It has a few stellar episodes under its belt that tell me it has the right parts in place. All that’s left is putting them together on a consistent basis. Very little of Juliette this week. I’m okay with that for now. I’m still on the fence with what exactly Renard is. The NBC website spoiler is looking a bit more difficult to justify, but he goes to great lengths to conceal himself from Nick.